Does overindulging in food makes you feel good? Do you usually find yourself craving for sugary, salty, high-carb foods? Do you find comfort in food? If you answered yes to all then there’s a great chance that you are an emotional eater. If you value your health, then you should realize that that immediate feeling of joy from gorging on food will not sustain you in the long term. The key to a healthy and happy life is balancing the desire for instant gratification with your overall fitness goals. 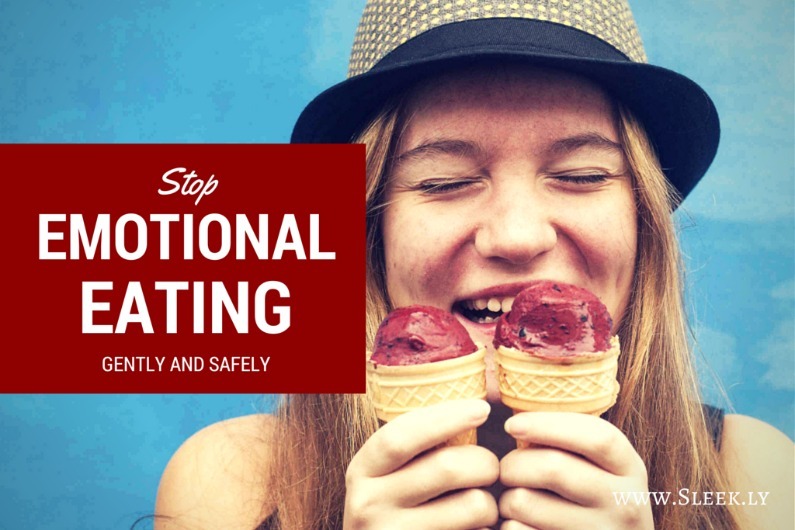 Below are some tips on how to stop emotional eating, in the most safe and gentle way, so that you can achieve a lasting state of happiness on your journey to a healthier body and mind. When your sweet tooth strikes.. Choose complex carbohydrates or the lower sugar fruits like berries. These choices will result in a steady release of insulin instead of those dangerous spikes that are followed by low-energy, mid-afternoon crashes. Go dark. Dark chocolate is considered a superfood because of its many health benefits. Cacao is one of the best sources of antioxidants, which help in preventing cell damage and protecting against free radicals. Brew that cup of tea. Resist the urge to get your latte in the morning. Get your caffeine fix from a different source: green tea. It’s loaded with antioxidants and has tons of health benefits, including increase in metabolism. It’s also good for your heart and skin. Once you understand why you are overeating you can dig even deeper for more healing. Reaching for food because of a low mood is a common habit of an emotional eater. This habit is usually picked up during childhood and can be very hard to shake. The best course is to do a little digging the next time you try to distract yourself using food. Ask you self a few questions. What are you feeling that you want to mask? Can you remember when you first started to use food in this way? Finding the answers to these questions can lead to major changes in your relationship with food. Just realizing that you are eating to feel better can be illuminating enough to help you put the breaks on this type of behavior. Using a journal to write down when you feel tempted and note any memories or emotions that pop up helps too. Accept that this behavior was likely a coping mechanism you took up when you were under stress and that it is totally normal, especially if it started when you were a kid. Now that you are older, you have the power to change this and any unwanted behavior that stops you from attaining your fitness goals. Off you go to a mindful, better, healthy eating plan.. The next step is to simply replace the unhelpful emotional eating with a new and better way of eating. Mindfulness can help with emotional eating habits, pick the healthy eating plan that you like the best and go for it with the knowledge that your old habits were not serving you. Write down your meals in your journal, even when you stray from the plan. Remember to go easy on yourself and go for slow steady improvement over time. The above approach will help you to gently and safely change your eating for the better, and gradually help you attain your health goals. Once you understand why you are overindulging, and realize you’re eating for emotional reasons, you can dig even deeper for more healing.